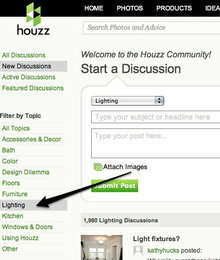 Houzz is a thriving community made up of people involved in design, remodeling or construction projects in all phases. Some may be just beginning to think about their projects, while others are ready to break ground or are putting the finishing touches on spaces. 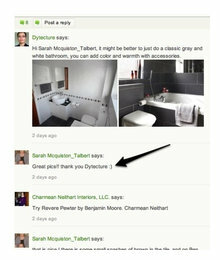 Getting involved with the Houzz community goes a long way toward establishing relationships with potential clients. Here are some simple ways to reach out. TIP 1. 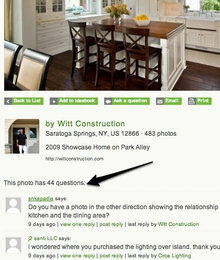 Answer questions posted to images you’ve uploaded to your Houzz profile. 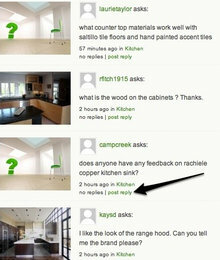 Even though the Houzzer asking the question might not be in your local area, your answers are posted to your profile and build awareness of your business. TIP 2. Answer discussions posted in the general forum. 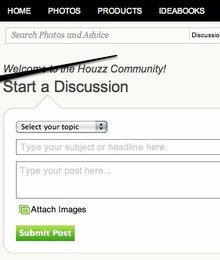 To find unanswered discussions, click on the Discussions tab in the top navigation bar. Then filter questions by timeliness, such as New Discussions, or by topic using the categories at the left. If your expertise is lighting, for example, filter to find all the discussions to that area. Stay in your comfort zone. If a discussion isn't in your area of expertise, it's OK to answer a different one. When you see a post that you can answer knowledgeably, dive in!